Betting preview, tips and enhanced odds as the Men's Miami Open takes place. Having been staged at Crandon Park for 32 years now, the Miami Open moves to Hard Rock Stadium, the home of the Miami Dolphins, so it will be interesting to see how conditions will differ. Last year, John Isner who made arguably the biggest shock this tournament has seen for over 30 years in winning the most important title of his career, and with all 19 ATP titles so far this year going to different men, there could well be another surprise this fortnight. Novak Djokovic has been the stand out performer at the Miami Open in recent seasons having won five of the last seven editions. However, he lost early on in California and has been handed an extremely tough draw this time around, as he’ll likely have to beat all of Thomas Berdych, John Millman and Roberto Bautista-Agut (who beat him in Doha) just to reach the Quarters. 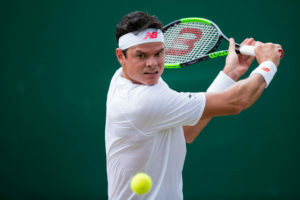 Instead, it’s Milos Raonic that appeals to us given he’s reached the quarter-final here in two of his last three attempts, while his quarters run at the Aus Open and semi-final run last week prove he is nearing his best again, making him a worthy front-runner in the market. John Isner and Kyle Edmund look to be the only real challengers to his chances on his run to the last eight and given neither have advanced past the fourth round of either of their Grand Slam and Master Series events so far this year, preference is for the Canadian. Dominic Thiem’s win last week came as somewhat of a surprise after he’d not really made an impression on the hard courts at this level. In fact, he’d been out of form on all surfaces for the start of 2019; losing in the second round at Melbourne and bowing out in the opening round of Rio on his preferred clay surface before travelling to Indian Wells. He looks set for a difficult test in Florida though with last week’s quarter-finalist Hubert Hurkacz a likely opponent for his opener, and so we’re happy to avoid the Austrian having never shown much consistency on this surface. Gael Monfils, who is 15-3 (W-L) this year, handed Thiem a walkover in their scheduled quarter-final last week, so we’ll steer clear of him too. Another man who has fitness ocnerns in this section of the draw is Nikoloz Basilashvili, so it looks a fantastic opportunity to side with someone form the bottom-half of the draw. 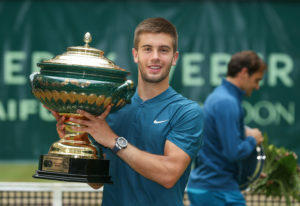 Gilles Simon, Borna Coric, Nick Kyrgios and Kei Nishikori are the seeded players in this part. Simon is the only one of those not to reach at least the quarters here, while he’s also out of form. Both Kyrgios and Nishikori are scheduled to meet in the third round, making Coric, who has the easier draw, the value play. Both Kevin Anderson and Gregor Dimitrov pulled out at Indian Wells. 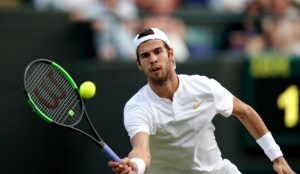 That leaves us fairly confident on Karen Khachanov’s chances of a quarter-final visit after winning 14 of his 19 matches this year and an impressive display last week. Only two tie-breaks separated himself and Rafa Nadal in the quarters, and this looks an even easier run into the second week for the Russian. If he reaches the latter stages, he will most likely have to face one of Daniil Medvedev, Diego Schwartzman, Stan Wawrinka or Roger Federer. The Swiss number one and two are scheduled to meet again in the third round this week and although Federer has a tremendous 23-3 record against Wawrinka, we’d rather avoid him with his trappy looking draw. What’s more, the Swiss Maestro has just one win here since 2007 and at the age of 37, we’ll plump for the in-form Khachanov. Denis Shapovalov continues to disappoint given the talent at his disposal. 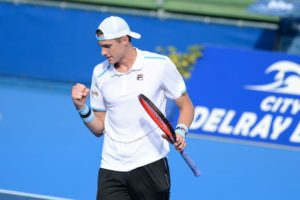 Last week was a real opportunity for him to go deep at a big tournament as he lost in the fourth round to the 54th ranked Polish player Hubert Kurkacz. 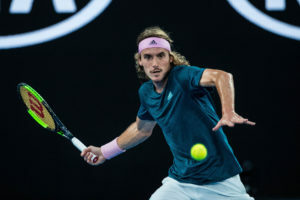 He beat Marin Cilic in that run who is looming for another third-round meeting this week, but perhaps the biggest threat looks to be in the shape of Stefanos Tsitsipas. The eighth seed may have dropped out in the opening round here last year, whilst he was disappointing at Indian Wells, but the Dubai runner-up and Aussie Open semi-finalist should provide a better showing this fortnight. He certainly appeals more than Alexander Zverev at almost double the price, especially following the German’s disappointing 6-3 6-1 defeat to Jan-Lennard Struff last week. He has gone 8-3 this season, but given he’s only faced one top-25 player, losing by an 11-game deficit to Milos Raonic, he is worth taking on. However, it’s hard to see Fraces Tiafoe turning around his terrible 1-4 form since the Australian Open, leaving the only man probably capable of stopping the German’s run to the fourth round the 95th ranked wild card Miomir Kecmanovic. The Serbian reached the quarters at Indian Wells but that was thanks to an easy draw and he’ll struggle to match that here.